Whether you call them brownies or energy bars, you will definitely call these dark chocolate treats pure bliss! We go through a lot of power bars/granola bars/ energy bars in this house, and I’m at the point where I no longer want to buy another, especially when homemade ones are profoundly more delicious, nutritious, and cost-effective. Granola bars and energy bars are a breeze: an amalgamation of whole grain cereals, dried fruits, nuts, seeds, and some “glue” (nut butter, natural syrup such as honey or maple syrup, etc. ), a quick press into a cake pan, and you’ve got tasty bars. Even the flops that don’t stick together make delicious trail mix. But what about a dark chocolate brownie bar? I had several requirements: (1) must taste like chocolate, not chalk-let; (2) must be all-natural; (3) must have no refined sugar (I am hyper enough as it is); (4) must have a significant amount of protein (i.e., more than the 3 to 5 grams in most homemade bars). Better still, the bars require no baking, can be enjoyed by meat-eaters, vegans, and raw foodists alike, and, the most important requirement for anything and everything I make and share here at power hungry, they are undeniably delicious. They are a lot like lara bars, but in super-chocolate form. A few notes before you give these a try. If you’re new to the world of raw food, the step for soaking the almonds may sound odd and/or unnecessary. But it has a specific function: soaking nuts makes them easier to digest and allows for greater absorption of the nutrients within. Click here to read more. From a cook’s perspective (that would be me :)), soaking the nuts makes these bars more “brownie-like”–much like the consistency of raw chocolate cookie dough. These carry the toddler (Nick), weight-lifting husband (Kevin), and pilates/yoga/running/aerobics-instructor/chef (moi) seal of approval. Enjoy! Easy, 4-Ingredient, no-bake brownies! They taste like pure decadence, yet they are also loaded with good-for-you nutrients! Place almonds in a medium bowl. Fill bowl with cold water (preferably filtered, but tap is fine) to cover the almonds. Let the almonds soak for 3 to 4 hours. Drain the almonds and pat dry with a clean dish cloth. Pulse almonds in food processor until finely ground. Add the dates and pulse until finely chopped and the mixture begins to resemble a thick "dough". Add the cocoa powder. Process until blended. Add a few drops of water, as needed, if mixture appears dry. Line an 8×8-inch baking dish with foil (trust me, it makes it so much easier to remove the bars). With wet hands, press the bar mixture into the pan. Place in the freezer for at least an hour. Cut into 12 bars. Wrap each in plastic wrap and store in the refrigerator (they need no refrigeration when packed in a lunch or gym bag). An equal amount of cashews walnuts, pecans, or pepitas can be used in place of the almonds. These look great. I love healthy treats like this. I recently made some similar cookies, but brownies sounds awesome! I would love to try these but need to be gluten free. Any ideas on what to replace the wheat germ with? Hi Katrina! Hope you can try them; aren’t no-bake healthy treats great? Nate, Natalie and Klara: Absolutely you can do these gluten free 🙂 You can up the flaxseed meal (using an amount equal to the wheat germ), leave wheat germ out altogether, or use an equal amount of rice bran (e.g., Bob’s Red Mill brand) for the wheat germ. I’ll add a note about making these gluten free in the recipe! nom nom nom that looks soooo good. i love it when you post vegan recipes! Wow, I can’t wait to try those! ooh, i’ve been telling myself to make some bars instead of buying them… have you tried pure bars? i like those for fuel before running, need ot make my own version! 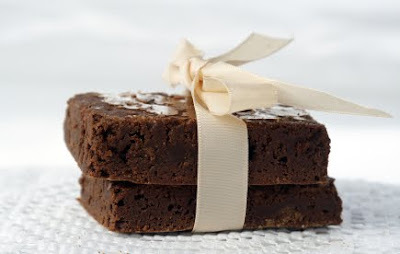 I tried these brownie bars this afternoon and while they didn’t turn out looking as dark or smooth as yours–I’m never able to grind nuts into a fine meal, so my bars are a bit chunky–they are addictively delicious! Thanks for sharing the fabulous recipe. Hi Genie, Tinity, Shannon, of HaikuTofu & Nico: try them, you will like (love ) them! Tiffany: Yay, so glad you tried them! Gringing the nuts fine does make a differnce , true, but they are yummy with a rough grind, too (as you deliciously discovered). Also, you can add more cocoa powder to taste if you like! Fitandclean: so happy you found me! Just so you know…a fabulous clean eating cookbook is in the works!!! Yum! these look so good. Do you think I can use hazelnut meal instead of almonds, or use a combination? If so, any guess how much nut meal is equal to a cup of whole nuts? I have a big bag I bought for a recipe and never used up, it is really finely ground already. Can I use roasted almonds instead of soaking raw ones? I think I will add some soy flour as you suggested since I have some in my fridge 🙂 Thanks for your blog, I just discovered it when looking for a larabar recipe and I love the focus on unrefined foods and limiting added sugars. Ooh, hazelnuts would be scrumptious here. I would use about 1/2 to 2/3 cup of the ground hazelnuts in place of the 1 cup nuts (start with 1/2 cup, add up to 2/3 once the other ingredietns are added–the mixture should be very thick). And yes, you can certainly use roasted almonds n place of the soaked nuts. So glad to have you visiting here! Oh man, I can’t wait to try this recipe! I’ve been searching for a power snack before my runs that isn’t super loaded with unnatural sugars. Thanks! I’ve typically failed when attempting vegan recipes…but refuse to give up…will give these a go….can I use dried prunes in place of the soft/pitted dates…?? I really liked these with the milk powder! Thanks for sharing the recipe. I can’t wait to try these–I just tried your larabars and fruit nut and seed ones last night–YUM! I have a question–is milk powder the same as powdered milk? I have a question about the dates, what would the measurement be in cups, roughly around 3 cups perhaps? Would it work if i want to cut back a little on the dates? Would the texture change a lot? Thanks! I can’t wait to try this recipe!! I bought the almonds and they’re soaking 🙂 What are your thoughts on using bananas instead of dates? Do you dry the soaked almonds (in oven or dehydrator) before using in this recipe, or no? Hi Liz! Good question. I typically let them sit about an hour before using, but you can simply dry with a clean dish towel and use right away. Cheers! Hi Lori! I completely understand–my 6-yr old son is also picky! Absolutely, you can do any other nut. You can also do seeds–I do sesame seeds (raw or unsalted roasted ones)–they are so much cheaper than nuts, super nutritious, and really tasty in the bars. Since you mentioned your son likes Clif Bars, I wanted to make sure you saw two more of my posts: one for homemade Clif Bars, the other for my Zee Bar Cookies (my take on the Clif Bar Zee Bars for kids). They are picky boy approved! 🙂 Cheers.